The trapezoidal footing formula is used to determine the volume of a trapezoidal footing from the respective drawing specifications. 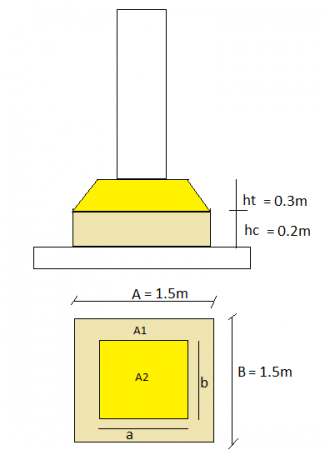 Here, the trapezoidal footing formula is explained and clarified with the help of an example. The trapezoidal footing formula can be explained with an example. 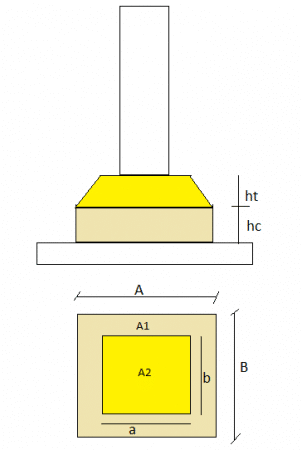 Consider a trapezoidal footing arrangement as shown in figure-3 below. Here, a square trapezoidal footing is taken into consideration. Let a= 0.8 m and b = 0.8m. The formula can be used for trapezoidal footing which is either rectangle or square in dimension.